Take a break from your hectic shopping schedule while at Lougheed Town Centre for some sushi at Sashimi Sushi. 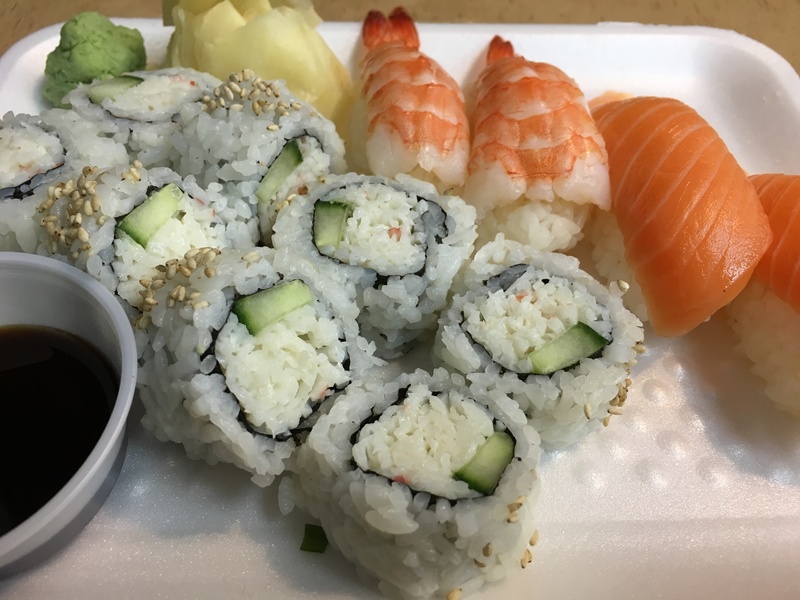 Located close to the food court, Sashimi Sushi has a range of sushi combos, rolls, and nigiri and are quick when it comes to fulfilling your order. A customer sits in Sashimi Sushi in Lougheed Mall. For a late-lunch, I ordered the Nigiri combo which consists of 2 Salmon Nigiri, 2 Shrimp (Ebi) Nigiri, and 8 pieces of California Roll. The sushi was just as expected from a shopping mall sushi experience, no frills and just ok tasting. Served on styrofoam plates, the fish was not particularly fresh nor exciting. It was also strange to see a Nigiri Combo where there was more sushi rolls than Nigiri and no Tuna either. The Nigiri Combo at Sashimi Sushi in Lougheed Mall. I also ordered a BC Roll to go with the combo. The BC Roll was particularly disappointing as the sauce had little flavour to it and just drenched the roll. The roll would have been nicer with either no sauce or just a little bit. The BC Roll at Sashimi Sushi in Lougheed Mall. Sashimi Sushi also offers a variety of take out options, including for hot lunch programs. They have a selection of Bento Boxes, Donburis (Rice Bowls), and Party Trays that are all reasonably priced. The good thing about my experience at Sashimi Sushi was that from the point of ordering to finishing my sushi and being back to the mall took under 20 minutes The experience was very quick, which is what you are sometimes looking for in a mall. The rolls were put together well and did not fall apart like at some other restaurants that are quick. There are only four seats in the restaurant and while I was lucky to get one, that food court is nearby so there is ample seating with a short walking distance. The food is definitely not the reason to go to Sashimi Sushi, however with the quick turnaround time in making my order, I’m sure I will eat here again when at Lougheed Mall. Sushi is a nice alternative for some of the greasier options at the nearby food court.